When Marley, a therapy dog, suddenly went missing from her home, this Canadian police officer was just the man to find her. Andrew Gordon's been called it all - from pet detective to animal whisperer - and he's certainly earned those titles. After all, it seems that his sworn duty to protect applies just as strongly to animals as it does people. In March 2015, Gordon, a constable with the Halifax Regional Police, rescued a wayward seal pup and helped get him back to the ocean. 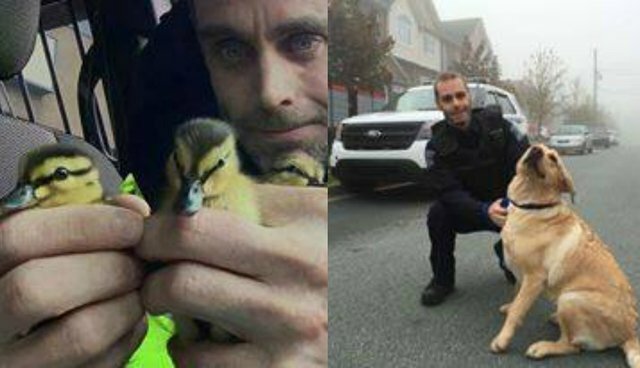 On Monday, he rounded up three ducklings - taking them away from danger when they were spotted waddling along a highway. Earlier this month, he saved yet another small duckling from a high-traffic area. And now he's the man behind the safe return of Marley. Marley had spending time outdoors with her family during a barbeque on Tuesday when they realized she was nowhere to be seen, CTV News Atlantic reported. The disappearance was especially worrisome as Marley is a trained therapy dog for the family's son, Luc, who has a rare brain and genetic disorder, and is trained to alert his parents when he needs help. She had become an indispensable friend for him, as well as a family member. Halifax police officers were called in and were out searching with flashlights and thermal imaging devices in the woods until 2 a.m. that night, but Marley did not turn up. But Gordon came across an online posting for a lost dog who had been found. Gordon didn't have an address, but he did have postal code information, which he used to head to the corresponding neighborhood and street on Wednesday morning. The first door he knocked on happened to be where the 2-year-old lab was residing with the woman who found her - and then he was able to bring Marley home. Despite his rising popularity with animals, at the end of the day, Gordon's a humble man who's touched by the work he gets to do. "It's pretty emotional," he told Metro News about rescuing Marley. "It's a good feeling to find her and get her home." Only time will tell what animal he saves next.